Because I am a retired librarian, books are my favorite gift for special occasions. Graduations, weddings, holidays and birthdays are excuses to browse a bookshop for a perfect present. Recently, I searched for a garden book to assist my daughter, a frustrated vegetable gardener. Like most urban Americans, my daughter has access to only limited gardening space. According to the online publication, Ground Maintenance, the average lawn in the United States is approximately one-fifth of an acre. Her San Francisco space is even smaller; she has been assigned a plot in a community garden. 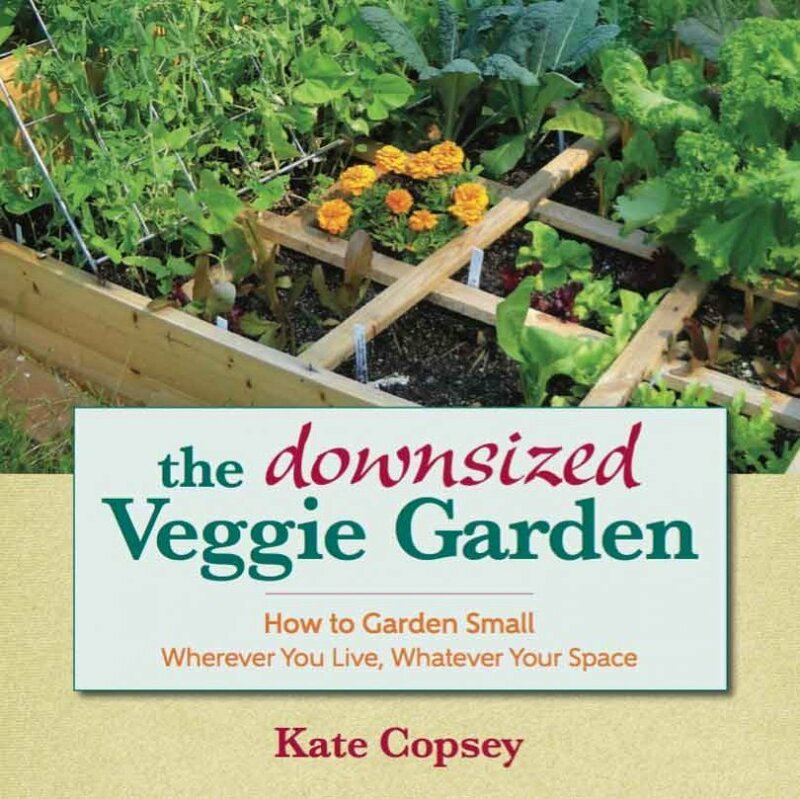 For advice on managing a minimal space, I will send to my daughter and recommend to others The downsized Veggie Garden (St. Lynn’s Press, 2016) by Kate Copsey. After years of spacious gardening, Copsey wrote this book based on her gardening experiences while temporarily living in an apartment and later moving to a home with a much smaller yard. In this volume, she incorporates knowledge acquired as a Master Gardener and as a garden writer to grapple with the challenges of creating a successful small garden. To have the amount of sunlight plants require, Copsey reminds readers to choose a residence that faces either east or west, if possible. She recommends beginning with a four-foot square sunny plot or a few scattered one square-foot plots. This small area is necessary to grow single plants, such as tomatoes, pole beans, peppers, and squash. In the same amount of earth, onions, cabbages, kale, lettuce, garlic, and other crops can flourish. Although this suggested 4×4 area seems small, it yields 16 spaces for the various vegetable types to grow. Copsey recommends for apartment dwellers container types and methods to keep the contents adequately watered. An attractive way suggested is to use a wall frame to vertically plant salad greens and herbs. For a patio privacy screen, she recommends a trellis covered with vining vegetables such as peas or pole beans. To get the greatest quantity of produce, Copsey describes several necessary concepts of gardening. As a starting activity, she suggests mixing her own recipe for potting soil of 20 percent perlite, 30 percent peat moss and 50 percent compost. Copsey presents the most dependable crops grouped by the season. She provides the names of smaller plant varieties when available. For those gardeners with space only for herbs, 12 plants for “favorite recipes” are introduced with instructions for drying and making herbal vinegars. Although my daughter’s garden is in San Francisco’s unique Mediterranean climate, this book gives sound advice for her growing efforts as well as for Triangle gardeners. Enough information is given here to grow great vegetables in ways “that suits your current lifestyle and your current homestyle,” wherever that may be. Featured image – The downsized Veggie Garden / St. Lynn’s Press.